Lottery Day, Goodman Theatre, closes 10/8/2017. IKE HOLTER (BFA, Playwrighting, ’07) is the playwright. McKENZIE CHINN (MFA, Acting, ’11) is in the cast. Twilight Bowl, Goodman Theatre, closes 10/8/2017. ERICA WEISS (BFA, General Theatre Studies, ’05) directs. Distance, Strawdog Theatre Company at Factory Theater, closes 10/1/2016. ERICA WEISS (BFA, Theatre Studies, ’05) directs. LORETTA REZOS (MFA, Acting, ’97) is in the cast. RICHARD LATSHAW (BFA, Lighting Design, ’17) is the lighting designer. 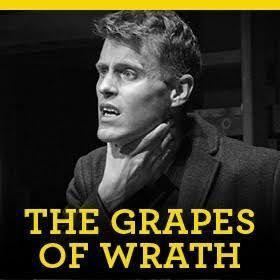 The Grapes of Wrath, The Gift Theatre, closes 8/14/16. ERICA WEISS (BFA, Theatre Studies, ’05) directs. CASEY MORRIS (MFA, Acting, ’15) is in the cast. ALARIE HAMMOCK (BFA, Costume Technology, ’09) is the costume designer and COURTNEY O’NEILL (BFA, Theatre Studies, ’06) is the scene designer. The Bachelors, Cole Theatre at the Greenhouse Theater Center, closes 4/10/16. ERICA WEISS(BFA, Theatre Studies, ’05) directs. ALARIE HAMMOCK (BFA, Costume Technology, ’09) is the costume designer, RICHARD LATSHAW (BFA, Lighting Design, ’17) is the lighting designer, and DAVID WOOLLEY (BFA, Acting, ’81) is the fight choreographer.